The station building is extant and in private occupation. The building is largely unaltered. Part of the up platform is also extant, although it has been substantially rebuilt and is probably little more that the original infill with a new surface and new facing. Notes: Newton Kyme was a small country station serving the tiny community of Newton Kyme and isolated houses and farms. In 1911 the catchment area of the station had a population of 591. 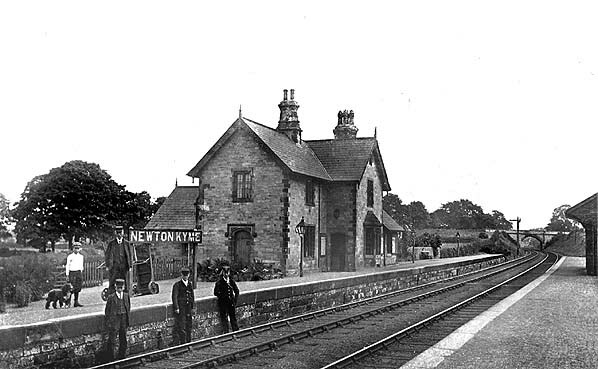 The station opened as Newton and was renamed Newton Kyme in August 1850. It had two facing platforms on the south-east side of the level crossing on the Wetherby road. 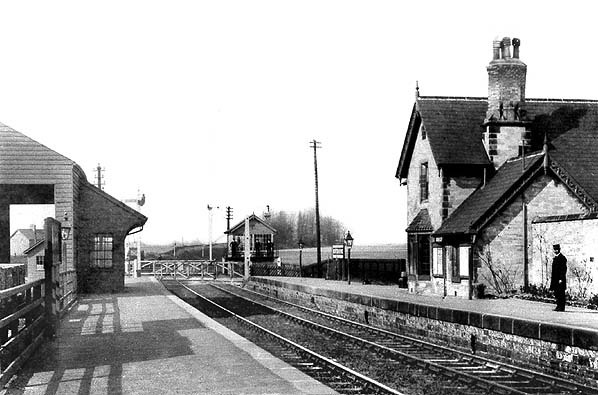 The main station building, designed by G T Andrews, was on the up platform and comprised an L-shaped two-storey stationmaster's house with a pitched slate roof and elaborately carved barge boards, typical of Andrews’ work, even for such a small wayside station. One gable-end faced onto the platform and included a bay window on the lower floor. This was the stationmaster's office, and the window allowed him to look both ways along the platform. The other gable-end faced north-west along the platform and included a door onto the platform. The other two faces of the building had single-storey extensions which included the booking office and waiting room. A second floor was later added to the wing at the front of the building. On the down platform was an open-fronted waiting shelter that backed onto a timber goods shed. A signal box north-west side of the crossing, on the up side, controlled the crossing and access to the goods yard. The main part of the yard was behind the down platform. This comprised a single siding accessed from the down line to the north of the station; it passed a short cattle dock before running through a timber goods shed with a pitched slate roof. There was a yard crane with a capacity of 1 ton 10 cwt. A second siding off a short loop with another dock north of the level crossing, also on the down side, passed over coal drops. In 1911 8,972 tickets were sold, and the main freight handled was barley, with 159 tons being dispatched with 95 wagons of livestock being loaded at the station. The 1956 handbook of stations states that the yard now only had a one ton capacity crane and handled general goods, livestock, horse boxes and prize cattle vans. In 1911 8,972 tickets were sold, and the main freight handled was barley, with 159 tons being dispatched; in addition 95 wagons of livestock were loaded at the station. The 1956 Handbook of Stations states that the yard now had only a one-ton capacity crane and handled general goods, livestock, horse boxes and prize cattle vans. 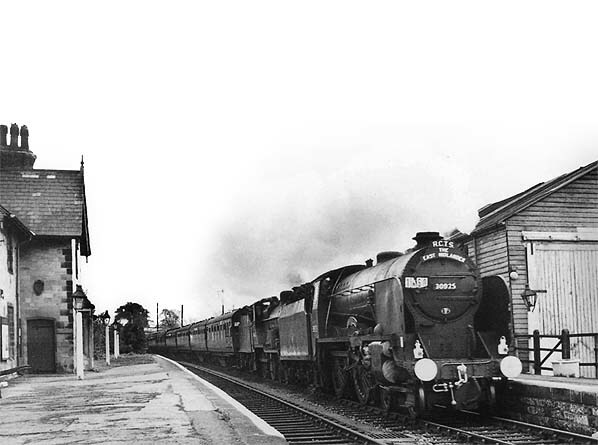 Newton Kyme closed to passengers on 6 January 1964 but remained open for goods traffic for a further six months, until 6 July 1964. The track around Newton Kyme was lifted in September 1966. 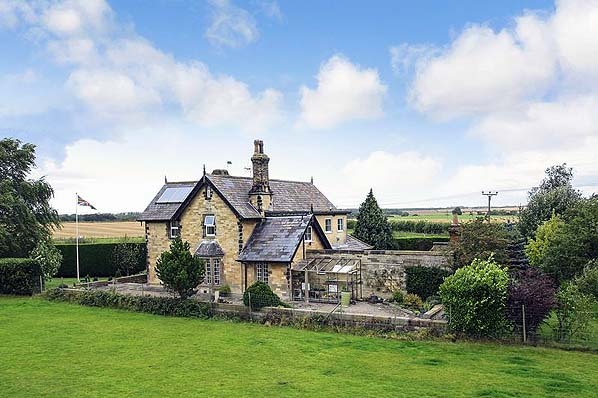 In 2013 the property was for sale with an asking price of £525,000. ROF Thorp Arch by Mike Cheesman - two articles in Archive (magazine) Nos. 22 and 23 June/September 1999. 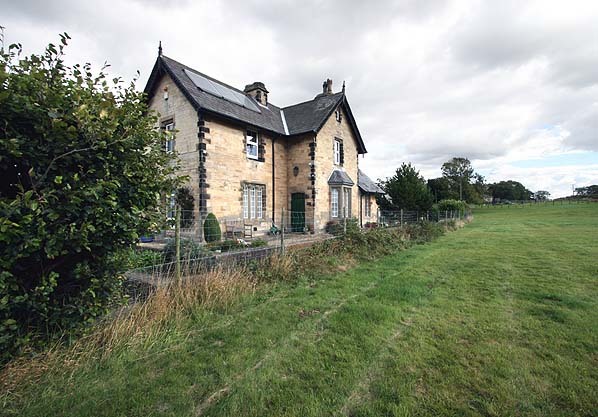 Newton Kyme was a typical G T Andrews wayside station with an attractive stone building and a lot of attention paid to fine detail. This posed view c1905 shows the stationmaster and his staff on, or in front of, the up platform. 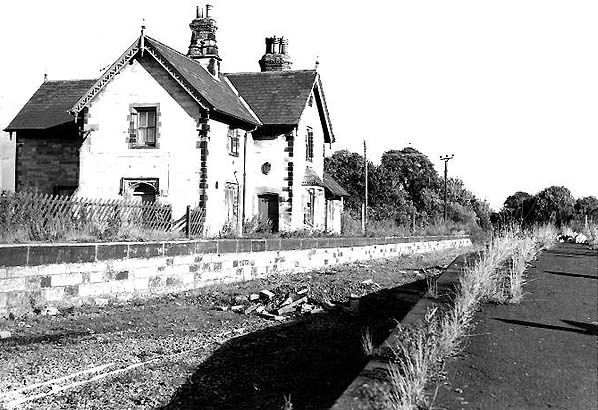 This view show the station building in its original state before a second floor was added to the wing at the rear. 1909 1:2,500 OS map shows the general layout of the goods yard, which remained largely unaltered. The main yard is behind the down platform where one siding is seen running past a cattle dock and then through the goods shed. A weighbridge is shown, although not identified, to the left of the dock. 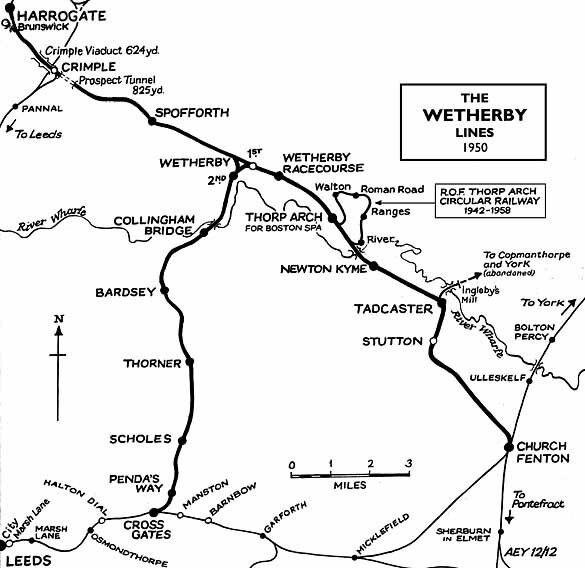 The coal depot is on the other side of the Wetherby road and comprises a short loop from which a single siding runs over coal drops. 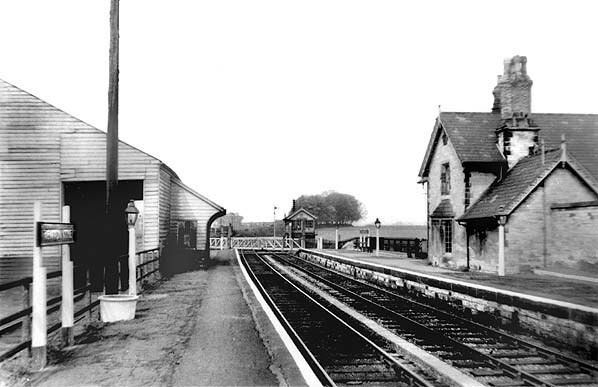 Newton Kyme station looking north-west from the down platform c1930s. The timber goods shed on the left is also the back wall of the open-fronted waiting shelter on the down platform. The signal box on the far side of the crossing controls the crossing and the two station sidings, one either side of the Wetherby road. The bay window overlooking the platform allows the stationmaster to look in both directions from his office, but on this occasion he is standing on the platform. 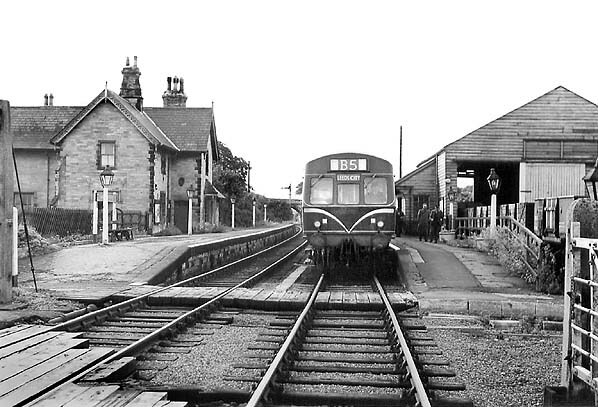 The same view in 1959 shows that little has changed apart from the station signs which have been replaced with smaller BR signs. The poster boards have disappeared from the station building; the station was now in its last years with no excursions to advertise. A newly painted white line is seen along the platform edge. wing facing on to the road. Wetherby, then on to Harrogate. 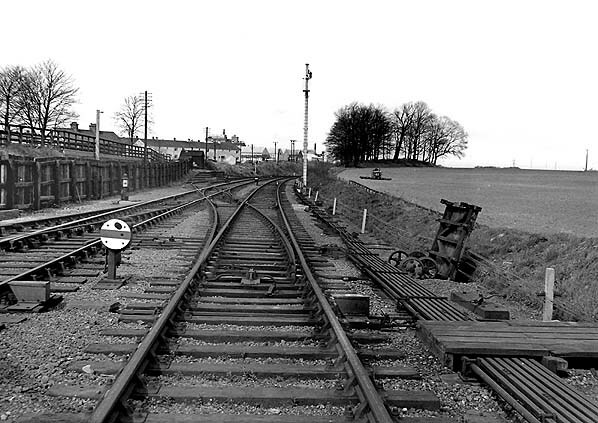 Looking south-east from the level crossing towards Newton Kyme station in April 1964, three months after closure to passenger traffic and three months before closure to goods traffic. 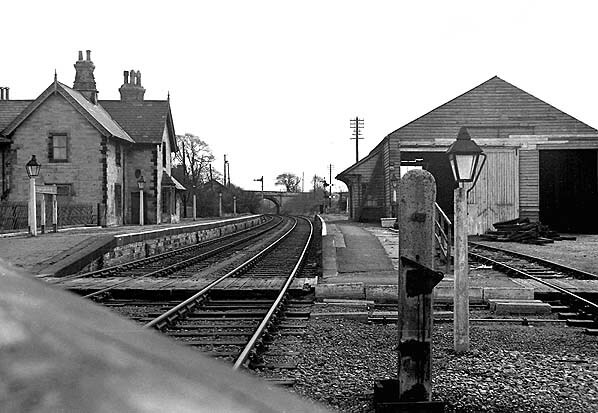 Looking north-west from Newton Kyme level crossing in April 1964. Signal arms have been removed and the down line is now the single line with the up out of use and rusty. Goods facilities at Newton Kyme were sited on both sides of the crossing. The goods shed (seen above) was behind the down platform but the coal depot was on the north side of the crossing, The embankment supporting the coal drops is seen on the left and in the distance a goods dock can just be made out. Click here to see an enlargment. The track at Newton Kyme was lifted in September 1966. 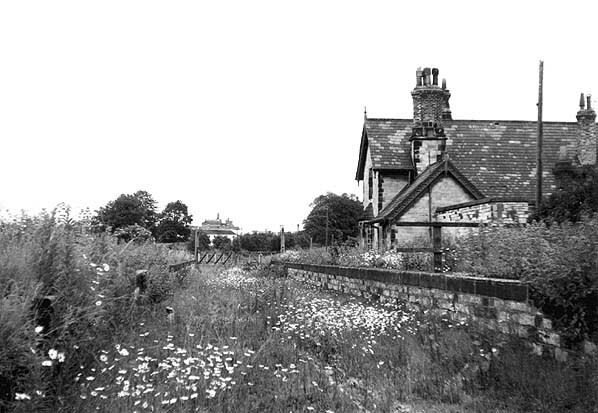 This view is looking south-east from the down platform in 1969. 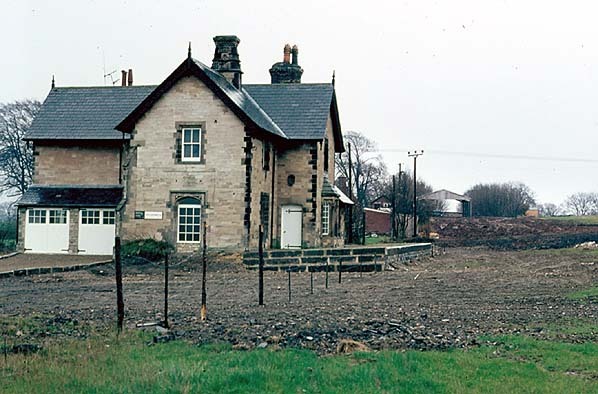 The waiting shelter, and presumably the goods shed as well, have been demolished. By July 1972 nature is beginning to take over, as seen in this view looking north-west. Newton Kyme station looking south-east in September 2010. A section of platform appears still to be in place but, as can be seen from the picture above, it has been substantially rebuilt. Newton Kyme station in 2012.